Would You Look for a Job the Same Way You Date? Networking can be a nightmare of human interaction if it doesn’t come naturally, so it stands to reason that humans would try to digitize the process in the hopes of weeding out the randos in a desperate search for your people. Can what works for dating also translate to jobs? The brave souls at Bumble are going to find out. That “empowerment” comes in the form of disallowing men to start conversations, with women being exclusively able to make the first move—ostensibly creating a space where guys don’t get to send creepy unsolicited messages, though never underestimate the ability of a dude to find a way to send creepy unsolicited messages. That Bumble is translating its template to the workplace has a special resonance considering Wolfe Herd was herself once the target of alleged gendered workplace harassment, settling out of court with former employer Tinder after a high profile lawsuit in 2014. If Bumble Bizz provides another way for women to screen and hopefully avoid sexist employers, then more power to them; unfortunately, as with their dating rubric, there’s no way to know how a man will act once you finally make the connection—and men are not the only employers who engage in sexist workplace behavior. 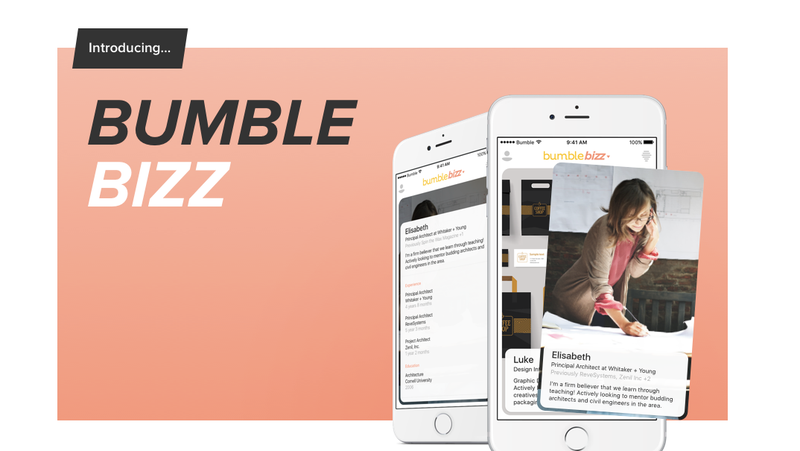 At the very least, it seems more design-y and millennial-geared than the stuffy climes of LinkedIn, though Bumble brags that it has 21 million users, as opposed to the 500 million claimed by LinkedIn earlier this year. Bumble positioning itself as a concierge for all your interpersonal needs, though, is smart in the hand-holding economy. Let the games begin.